As a brilliant way of raising money, for the past few years the Rutland Osprey Project have had a second-hand book stall at the Lyndon Visitor Centre at Rutland Water. The books are donated by generous volunteers, staff and members of the public, and all money raised from the sale of these books goes directly towards our Osprey Clubs scheme in West Africa which we run in partnership with the Project. 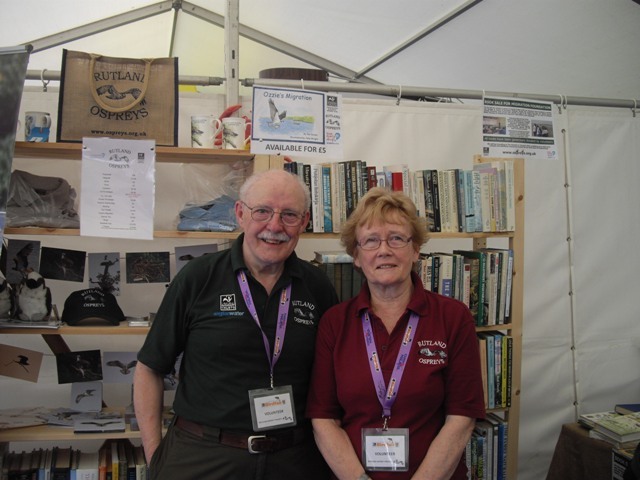 The book shelves are kindly looked after by volunteers Andy and Anne Strang (pictured below), who have donated a lot of books themselves over the years!The shelves are currently stacked almost full of amazing tomes about everything wildlife related. There are some incredible finds in here, and the prices are extremely reasonable. Head over to the Lyndon Centre and have a browse! A huge thank you to all the staff and volunteers at the Rutland Osprey Project for facilitating this!